An annual report examining physician-assisted suicide trends in Oregon shows a growing number of individuals seeking to die under the state’s Death with Dignity Act. 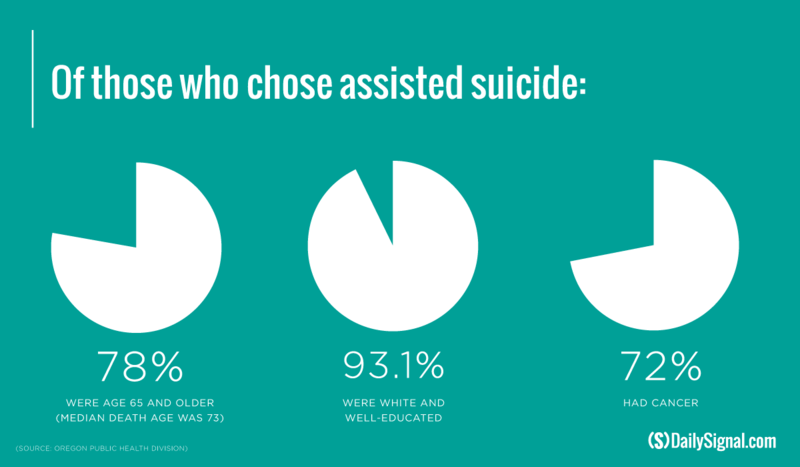 In 2015, the Oregon Public Health Division reported that 132 people died using physician-assisted suicide, compared to 105 the previous year. The number of people who received the life-ending prescription increased from 155 in 2014 to 215 in 2015. Advocates for physician-assisted suicide attribute the rising numbers to a growing acceptance among doctors to prescribe the life-ending drugs. “As more physicians recognize that a small percentage of terminally ill adults experience unbearable suffering that no medical treatment can relieve, they are more accepting of voluntary requests for aid in dying medication,” Sean Crowley, media relations director at Compassion and Choices, told The Daily Signal. “While the percentage of terminally ill adults who utilized medical aid in dying rose by a fraction of a percent to less 0.4 percent of all deaths in Oregon last year and may grow slightly in future years, the percentage will always be very small because hospice and palliative care can provide relief for most dying people,” he said. 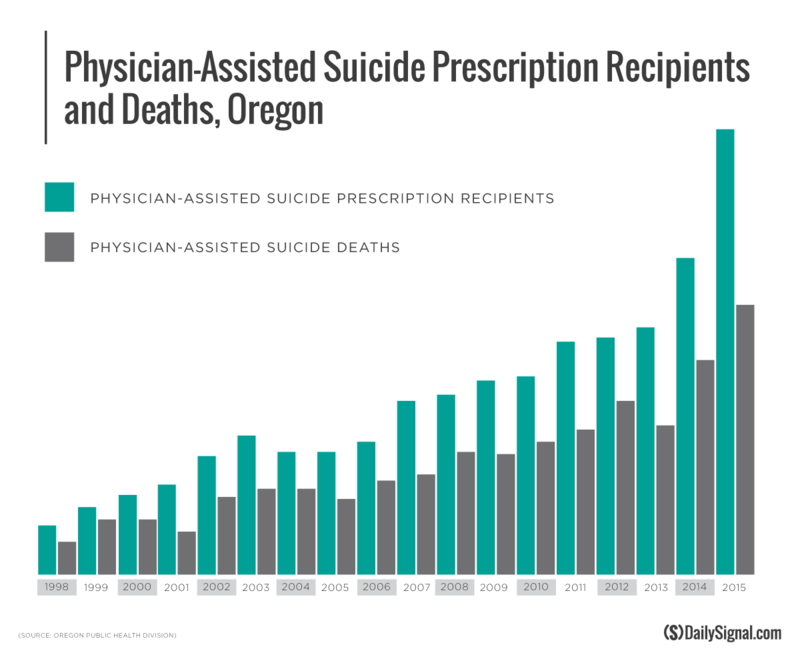 In 1997, Oregon became the first state in the nation to legalize physician-assisted suicide. It has since been legalized in Washington, Vermont, and most recently California. Physician-assisted suicide laws, often titled “Death with Dignity” bills, permit mentally competent, terminally ill adults to obtain a prescription for life-ending drugs from their physician. Of those who chose the life-ending option, 78 percent were 65 and older, 93 percent were white and well-educated, and 72 percent had cancer. While the overall percent of Oregon’s population seeking physician-assisted suicide was small—less than 0.4 percent of the state’s population—critics point out that when applied to states like California that have much higher populations, the numbers quickly grow. 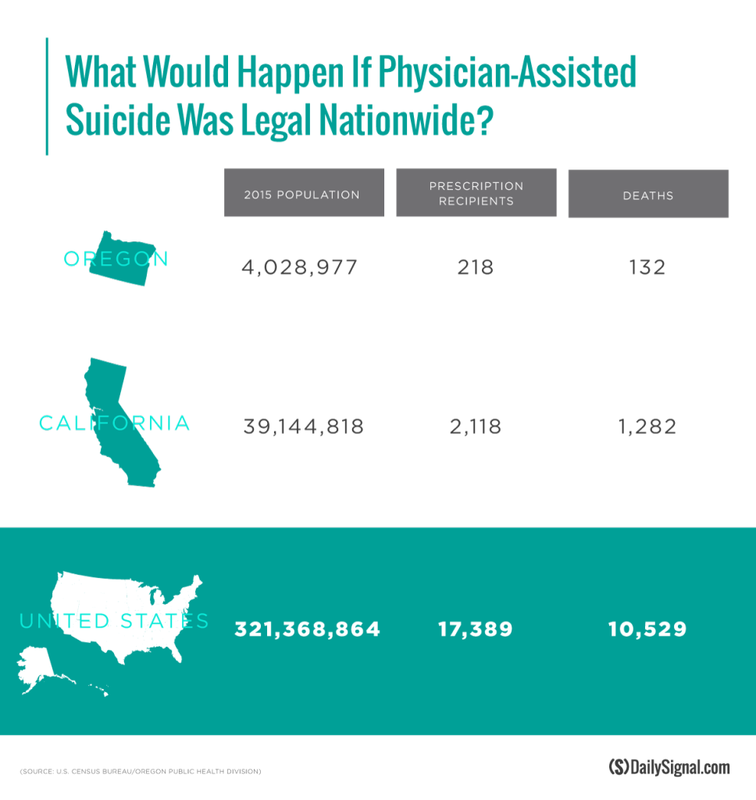 If the rate of physician-assisted suicide deaths in California were the same as Oregon’s rate, that would result in 2,118 deaths a year. That happens everywhere you see assisted suicide or euthanasia legalized. When you consider a country the size of the United States—even right now using Oregon’s numbers, which keep going up every year—you have well over 10,000 per year who would have assisted suicide, which is not a small number, particularly when you consider that even though we pretend that these are not suicides, these are suicides. Those who oppose “Death with Dignity” laws look to Europe, where three countries—the Netherlands, Belgium, and Switzerland—allow assisted suicide for non-terminal illnesses, including psychiatric disorders like depression and schizophrenia. 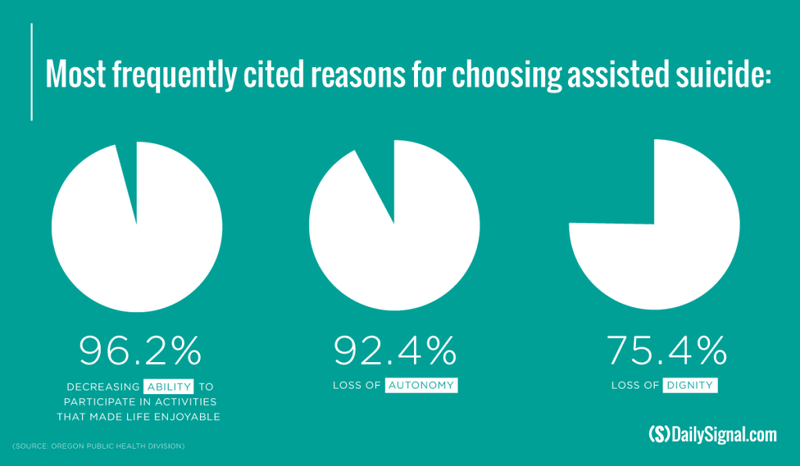 The results show that the patients receiving [euthanasia or assisted suicide] are mostly women and of diverse ages, with various chronic psychiatric conditions, accompanied by personality disorders, significant physical problems, and social isolation or loneliness. Refusals of treatment were common, requiring challenging physician judgments of futility. 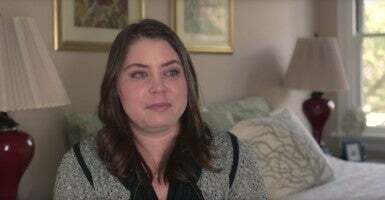 Compassion and Choices, which brought the issue of assisted suicide to the attention of many Americans through the story of Brittany Maynard, a 29-year-old with terminal brain cancer who opted to use physician-assisted suicide, argues that JAMA’s study is irrelevant to the discussion here in the United States because no one is advocating for assisted suicide laws to apply to patients who are not terminally ill or mentally competent. Critics, however, argue that the evolution is inevitable as more people become accustomed to physician-assisted suicide. Before long, they say, death by suicide will become the new norm. The sentence, “Montana and New Mexico have adopted more restrictive versions of assisted suicide,” was removed from this article after publication. 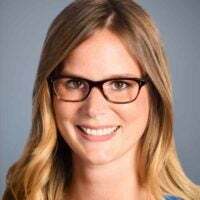 Kelsey Bolar is a senior news producer at The Daily Signal and co-host of "Problematic Women," a podcast. Send an email to Kelsey.